Now that we’re all on the same page about beauty starting on the inside (bring on the leafy greens! ), let’s talk vitamins. More specifically, why it takes a doctor’s visit and/or hours of tunneling through online reviews to figure out exactly which supplements you need for your glowy goddess goals. The good news? Finding your vitamin match is easier than you think. 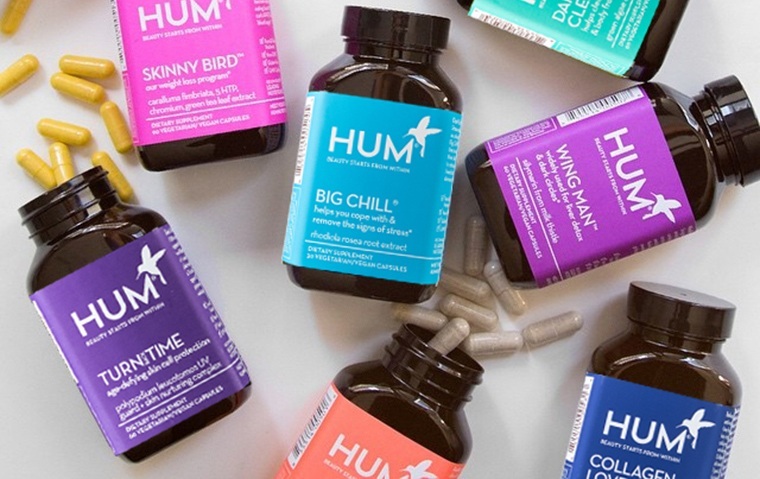 HUM Nutrition, the natural supplement line that’s buzzed about by both beauty and wellness insiders, offers a three-minute online quiz to give you a personalized holistic wellness profile and vitamin recs courtesy of a registered dietician. AKA, a specific plan of what you need to deliver results now and protect against future concerns down the line. Considering that some nutrients aren’t readily accessible in food (and can have a major impact on your appearance), figuring out your beauty Rx should be just as important as finding that perfect vegan lipstick. The line is built around one goal: Using science-based nutrition as a tool for looking and feeling amazing. It’s free of soy, gluten, GMO ingredients, artificial colors, and preservatives (and yes, there are also vegan options that are encapsulated in algae instead of gelatin). Once you’ve got your custom recommendations in hand, you can snag flexible, ongoing subscriptions to stay covered long-term. Bonus: The insanely cute (and eye-catching) packaging is basically a built-in reminder to take your vitamins. Want shinier hair? Clearer skin? Supercharged energy? Scroll down for a comprehensive guide to natural supplements for every type of beauty goal. Vitamin E (courtesy of sunflower seed oil) and fatty acids (thanks to black currant seed oil) are the stars of this formulation designed for super shiny hair, hydrating both parched strands and skin cells. No red carpet necessary—why not look lit-from-within at your morning workout, too? Chock full of fiber, antioxidants, and gut-friendly probiotics, this superfood powder mixes into smoothies or water for a natural sustained energy boost and a daily health hack. In total, 39 ingredients praised for their skin-clearing and adaptogenic powers (like matcha and ginseng root) make up one heady beauty beverage. Whether it’s daily contact with pollution or, you know, just living life, experts say we’re all exposed to toxins that can wreak havoc on our appearance. The solution? Organic algae (known as a liver-detoxifier with anti-inflammatory properties), which is part of a jam-packed herbal blend designed to get you looking bright-eyed—and feeling better—quickly. By now, it’s no surprise that probiotics—which boost beneficial bacteria in your gut—can have a major impact on your body. Namely, helping to improve digestion, boost your immune system, and even clear up problematic skin. This version uses two good bacteria families (lactobacillus and bifidobacterium) in a formulation designed to give your gut health a serious upgrade. Staying calm and focused is easy! (Said no one ever.) Luckily, you can get a little help in that department from rhodiola, a root extract that is said to reduce anxiety and stress, which can lead to tired skin and dark under-eye circles. Plus, it can help you stay super sharp at the office (instead of falling into a mid-meeting stupor). If you feel like you could use some extra TLC in your skin-care routine—outside of your sunscreen habit and daily eight glasses of water—collagen is your gal. This bottle packs three types of collagen (plus moisturizing hyaluronic acid and grape seed extract) to support your skin’s natural elasticity and repairing processes. Beauty secret weapon, found.